If someone told me five years ago that I would be making my own yogurt, I would have laughed hysterically. Five years ago, I was in between planes, working on weekends and the most that I was able to cook was fried eggs. Then, I married and moved to the USA. I was trying to adapt to the new life. I could have landed a fantastic job, but honestly, I did not really want to go back to a hectic schedule. I have worked since graduate years, working my way up in the Human Resources field. All my life, I was either the youngest manager or the only woman on the management team. I enjoyed working hard, did not mind the long hours, but when I moved here, I felt that I needed to do something else. I didn't want to work for the corporate world, I wanted to do my own thing. I am still finding out what that is, but one thing is for sure... I never thought that I would be making my own yogurt. Making your own yogurt is the greatest example of successful executive management. You - the executive power - need to put in very little effort, make a couple of decisions, which must be timely, and the rest is the work of the culture. I now make yogurt once a week, usually around 8:00 pm and by the time I wake up, it is ready. All the real work is been done over night. In the Middle East, we eat a lot of yogurt. Over there, yogurt is considered a savory dish. I still give my husband a weird look when he eats it as a dessert, mixing with honey and bananas or in a smoothie. Savory or sweet, we eat a lot of yogurt. What I love the most about making my own yogurt is that I know that it is organic, I can control the fat percentage, I don't waste packaging and it is economical. You don't really need special equipment for making yogurt. Remember that our grandparents made their own yogurt and they did not have any of the fabulous tools that we have today. 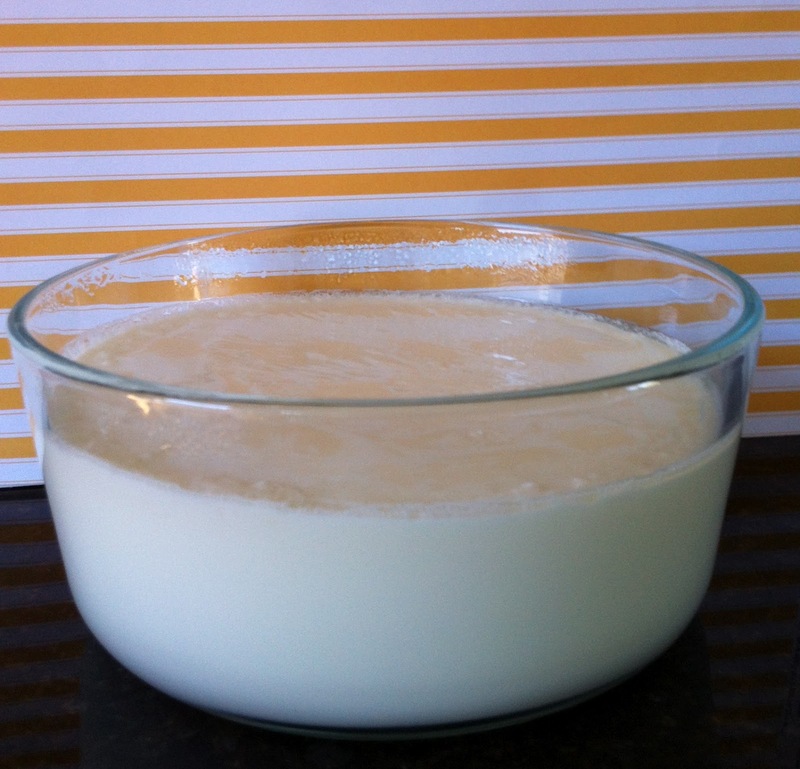 Having said so, I will give two ways to make yogurt: the traditional way and the technology-saavy way. Clean glass bowls (I love Pyrex bowls because they are transparent so you can see what is inside and they come with their own lids. I use the 2.5 quarts (2.35 liters); the 1.5 quarts (1.4 liters) and 1 quart (0.94 liter) glass bowls. Clean instant-read digital thermometer (if you prefer the technology-savy method). An non instant read thermometer works too. 4 Quarts of 2% Organic milk (16 cups). You can use whole milk, or even fat free milk. 11 tablespoons of yogurt starter (Now I have tested using yogurt made by tante Im Ma`an, the mother of my friend Nahla. Tante Im Ma`an made her yogurt from a starter similar to the slightly sour yogurt made back home. I also used Fage Greek yogurt which yielded a sweeter yogurt.) When buying yogurt for starter, I like to buy Greek yogurt because they have live culture in them. I have edited this recipe because I noticed that when add more start yogurt, the end result is a creamier yogurt. Make sure to take your start yogurt out of the fridge ahead of time. It should be at room temperature when added to the milk. If it is too cold, it will lower the temperature of the milk too much where the culture can not be activated anymore. It is all about the culture when making yogurt! Active time is 5 minutes. Inactive time is 40 minutes (between the boiling and cooling of milk). Incubation time is around 12 hours. It is important to start with very clean tools because grease and dirt interfere with the making of the yogurt. 1. 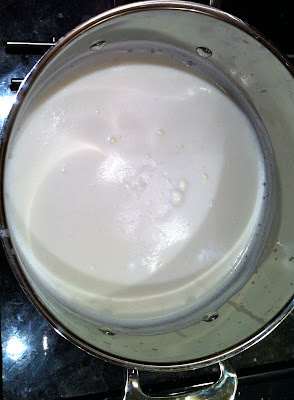 In a big clean stainless steel pot, bring the milk to a boil over medium heat. You start seeing bubbles rise to the top. If you are using a thermometer, it should be around 180 F.
2. Remove the pot from the heat and let it stand until cool. 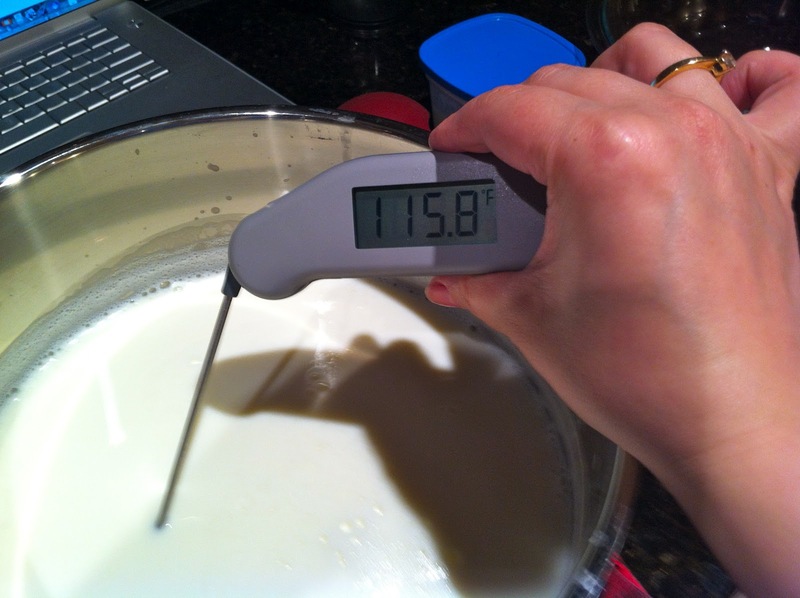 You should be able to stand the heat when you put your clean pinky (little finger) in the milk and count till 10. It should not be cold, otherwise the culture will not be able to do its magic; and not too hot, or the culture will be useless. If using your thermometer, the temperature should be between 110 F and 120 F. The best is around 115 F.
3. Pour the milk into the Pyrex bowls. 4. Stir in five tablespoons of the yogurt starter in the 2.5 quarts glass Pyrex bowl and three tablespoons in the other two bowls. Close them with their lids or, if not using Pyrex, cover them with a plastic food wrap. 5. 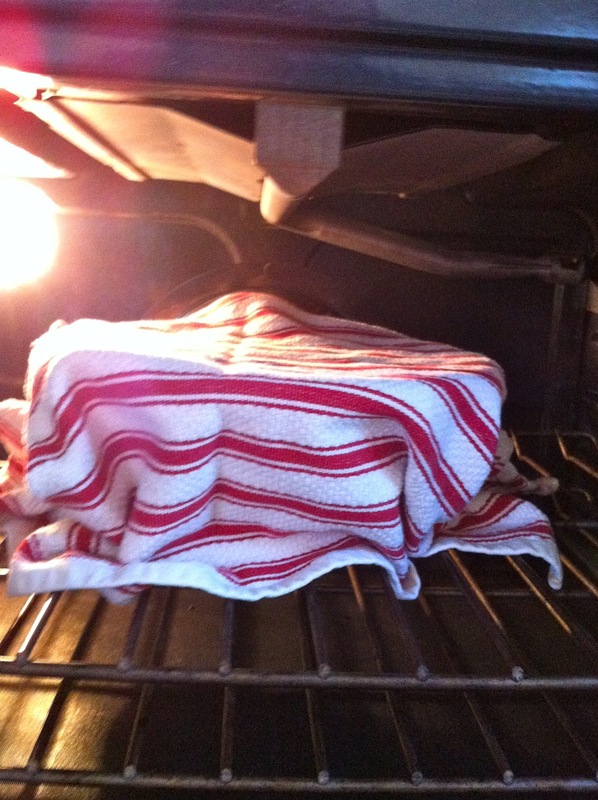 Cover each covered bowl with a kitchen towel and place it on the rack positioned in the upper quarter of the oven with the oven light on. Before putting the bowls in the oven while waiting for the milk to cool down, you can preheat your oven for one minute to any temperature and turn it off. This helps keeping the oven warm. Do not forget to turn the oven off after one minute. Close the oven door. Allow to rest undisturbed. Do not touch, move or shake the bowls. That is why I love using the oven for the incubation of the yogurt. I especially like making my yogurt at night while it is not in use. If you don't have an oven, don't worry. You can wrap the bowls with a blanket and let them rest undisturbed in a draft free corner of your kitchen. Again remember - no touching, no shaking. 6. Let the magic work over night. I usually wake up in the morning and I have my beautiful yogurt ready. sometimes it may need more or less than 12 hours, mine usually is ready within 12 hours. Refrigerate the yogurt and enjoy. 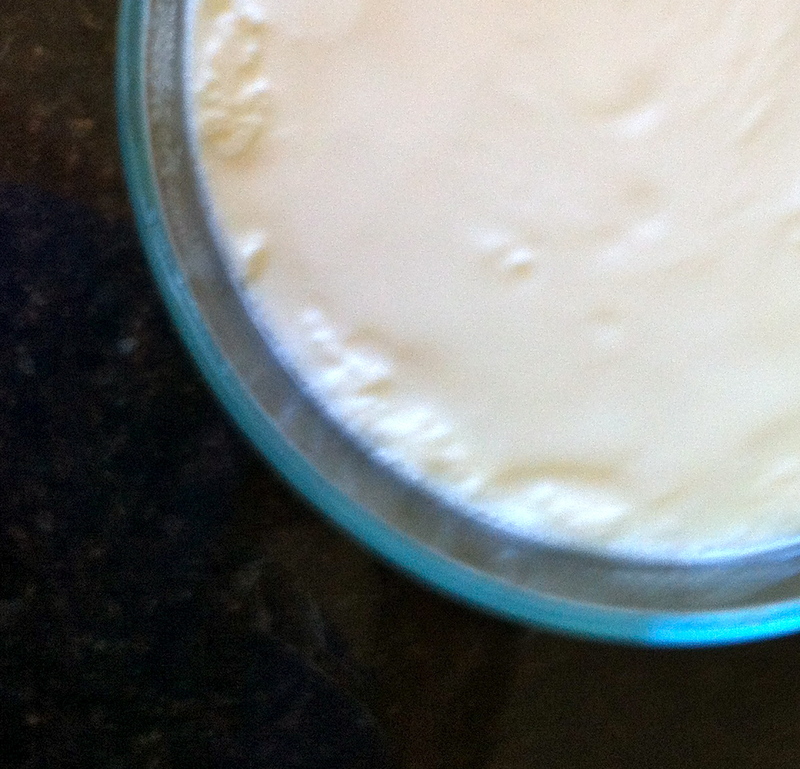 There is something magically rewarding about making your own yogurt. And my yogurt story is not over yet.. stay tuned, because in my next blog, I will show you how to make Labneh or Kefir Cheese from this beautiful homemade yogurt. I will try it this week! Thank you. Piyusha, yogurt making is one of those things that I really wanted to learn how to do but when I ask around I get really confusing instructions. That why I tried to make the instructions clear as much as possible. Let me know how it goes. Marisa, best of luck! let me know how it goes! Hi Nadine. I had Persian guests years ago when I was in school. They made yogurt similar to your way but instead of letting it cool all the way they added the yogurt to the milk when it had just cooled enough to touch the pot and then put it to bed and wrapped the blankets around and around the pot. 8 hours later yogurt. For obvious reasons, they always started yogurt in the morning. Hi Unknown, I dont let the milk cool all the way, I let it cool just enough to be able to put your pinkie in the pot and handle the heat, that around 115 F. If you let it cool all the way, then the milk would not be a good milieu for the culture to do its magic. On the other hand, if you put the culture too soon while the milk is too hot, it will kill the culture. To simplify my life, I use an instant read thermometer.